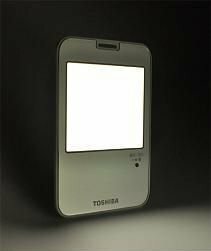 Toshiba's portable OLED lamp is a prototype, but the company will make 100 units of this lamp and donate these to quake-hit areas in Japan. Toshiba has no plans to sell these to consumers. The lamps run from either four AAA alkaline batteries or from the embedded rechargeable battery - and Toshiba bundle the lamp with a solar-panel (it can also be recharged via a USB port).